Palazzo Davanzati is not to be missed, it's simply wonderful. 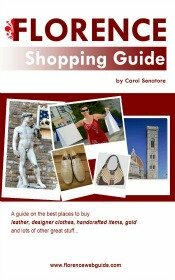 Walk into a Medieval Florentine home and see how a wealthy merchant family lived in the 1400's. When you visit this 14th century palace you feel as if you've gone back in time. The building was built in about 1340 and has been perfectly restored to show how people lived in Florence in the Middle Ages and in Renaissance times. All the furniture, paintings, tapestries and houseware objects in the Museum of Palazzo Davanzati date from the 14th to 16th centuries and are in mint condition. 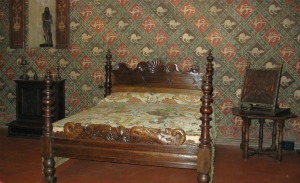 What was a Medieval solution to sitting up in bed comfortably? And why don't these exist today instead of having to constantly re-adjust pillows.....? Wooden furniture was a luxury for few back then, so where did they put all their stuff.....? You'll find out the answers to these questions about life in Medieval and Renaissance times at Palazzo Davanzati. The picture on the right will give you an idea of what this charming house-museum is like. In this part of Palazzo Davanzati we can see a fireplace in the background and a baby's crib in the foreground, a religious figure and the way the walls are elaborately decorated. 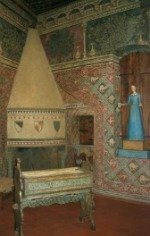 In fact, painting walls from top to bottom was common in the Middle Ages. 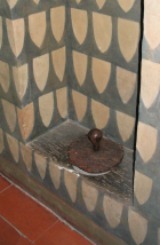 People wanted the walls to look as if they had decorative curtains and fabrics covering the stone. But ornate materials and fabrics were too costly for most people, so painting was used as a cheap alternative. Even curtain rods and rings to hold the 'drapes' have been painted at some spots in the house, and the painting is made to look as if the 'curtains' are folding backwards, revealing a part of the wall. Very few examples of this type of interior design remain today, another reason why the Medieval Florentine Home museum in Palazzo Davanzati is so unique. The Grand Hall on the first floor tells another story about Medieval life. You'll see that the room has four holes built into the floor, each covered with a wooden lid. If you lift the lid, you see into the building courtyard below (quite a feeling of vertigo actually). This was the system to get rid of unwanted guests: throw a hot liquid - boiling oil perhaps? - or even a huge stone ball (there's one of these on display as well) onto the intruder through the hole! It seems that in the 1400's buildings had no locked doors, so this method was put into place to keep unwanted guests away. The building and its courtyard are also worth seeing. The stoney facade is decorated with the majestic coat-of-arms of the Davanzati family. Inside, you get to the different floors by a stone and wood staircase that winds around a uniquely shaped courtyard. The top storey has a romantic pillared loggia, which can also be seen from the street. I can't imagine anyone not appreciating this Florence museum so I definitely think it's worth a visit. The ticket is embarrassingly inexpensive (€2), it only takes about an hour to see, it's located in the heart of town so is very convenient to get to, and there's hardly ever a line to get in. In order to visit the 2nd and 3rd floors -a 'must' in my opinion - YOU NEED TO RESERVE, otherwise, you only visit the courtyard and first floor. Visits to these floors take place everyday at 10, 11, and 12 o'clock and need to be booked in advance. To book you can call at + 39 055 23 88 610, or just book when you buy your ticket by telling one of the staff to put you on the list for the next tour. Explanations are provided in English and Italian. Elevator available for access to all floors if needed.